PALM BEACH GARDENS, Fla. -- Tougher than your average bear, the reputation of the Champion Course at PGA National Resort & Spa is a burly one. The Champion Course at PGA National Resort & Spa has more bite beyond the infamous "Bear Trap." In the 2011 staging of the PGA Tour's Honda Classic, the "Bear Trap," holes No. 15 through 17, proved especially vicious. In the four rounds of action, the par-3 15th hole swallowed up 60 balls, the par-4 17th claimed 25 and the par-3 17th captured 65 balls -- making for 150 total and the most ever recorded at the event. "It's not about length," said Jack Nicklaus, designer of the Champion and the infamous three-hole stretch. "It's about precision. It's about guts. It's about what do you have in your chest that you can finish those holes." Undeniably one of south Florida's top challenges and a staple of the PGA Tour's Florida Swing, the Champion has had two forms during its existence. The golf course was originally built by George Fazio and his nephew Tom in 1981 but was redesigned by Nicklaus in 1990, who aside from the routing, laid out an entirely new golf course. In recent years, the course and resort have received $65 million in enhancements and renovations. The Bear Trap certainly won't be the first time your golf swing -- or nerves -- will be challenged on the Champion. After a relatively easy start to the course, the par-5 sixth (which plays as a mighty par 4 during the Honda Classic) has a narrow fairway wedged between bunkers right and water all down the left side, worthy of making this hole the No. 1-handicap hole on the course despite modest length for a par 5 (488 yards from the back tees). The 11th is a sleeper pick for the toughest par 4 on the course. The tee shot requires both an ideal line and the right club in your hands; too much, and your ball may trickle into the drink. Golfers must challenge the pond that comes into play off the tee as close as possible in order to minimize a long carry over water on the approach shot, which could be upwards of 170 yards. Once you've escaped -- or surrendered to -- the Bear Trap, the course culminates with the chance to get a stroke back with a closing par 5. While the landing zone for drives is pretty large, there is all kinds of trouble lurking from here in, whether it's finding a safe spot to layup between bunkers or going over water to the shallow green with a hybrid. 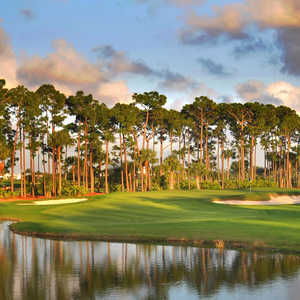 The Champion at PGA National has one of Florida's most reputable designs to challenge low-handicappers. But despite its reputation during tournament week, the course is not overwhelmingly penal from the forward sets of tees. There is a little more room for error compared to another famed Florida golf course: Pete Dye's Stadium Course at TPC Sawgrass, home of the PLAYERS Championship. Golfers can also head about an hour south to the TPC Blue Monster at Doral and determine for themselves which is the better play. The Champion and the other 72 holes at PGA National have another perk for nature buffs: scores of different bird species that call the course home, especially on the back nine. It's easy to forget about a wayward shot or two when an exotic bird lands on a tree right next to you. Also, golfers who want to enjoy the walk even more can enlist in the resort's caddie or forecaddie service. 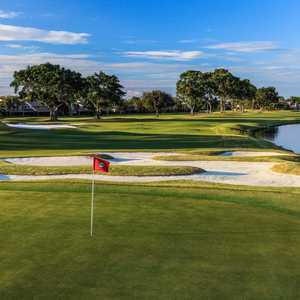 With 90 holes, PGA National is one of Florida's great meccas for golf. Three additional 18-hole courses are located right on site besides the Champion, so resort guests can come for a long weekend and never play the same course twice. 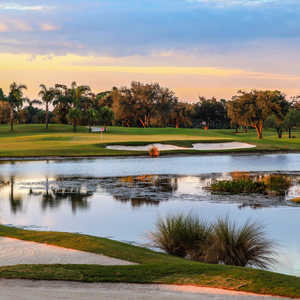 PGA National's Palmer Course generally plays second fiddle to the Champion, but it climaxes with a par-5 closing hole with a narrow fairway played to an elevated green guarded by trouble left and right. The hole is as equally dramatic as the Champion's closer. The Haig Course was the first of the five courses to come to PGA National and was designed by the team of George and Tom Fazio. This duo also designed the Squire Course, a shot-maker's course and the shortest at the resort at just less than 6,500 yards. Five miles west of the resort is the Estates Course, a Karl Litten design that features wide fairways -- and water on 17 holes. In addition to the golf courses, the resort has two signature teaching academies: The David Leadbetter Academy of Golf as well as the Dave Pelz Scoring School. Each has their own teaching area, and the resort's extensive practice facilities allow the opportunity to work on every shot in the bag.